In the early 1900s, the budding movie industry creatively used publicity to cement its foothold in the entertainment world. One easy marketing method was to create paper dolls of leading actors and actresses that were reproduced in popular magazines. This marketing strategy allowed the movie industry to quickly get the faces and names of their stars into the homes and hearts of fans. Hollywood’s first major child star, John Leslie “Jackie” Coogan (1914–1984), got an early start in vaudeville and silent movies before his breakout role in the 1921 movie The Kid. His character, raised by Charlie Chaplin’s “Tramp” into a life of minor crime, was finally reunited with his mother, who had earlier abandoned him as a baby. Studios quickly cast him in a succession of similar roles. 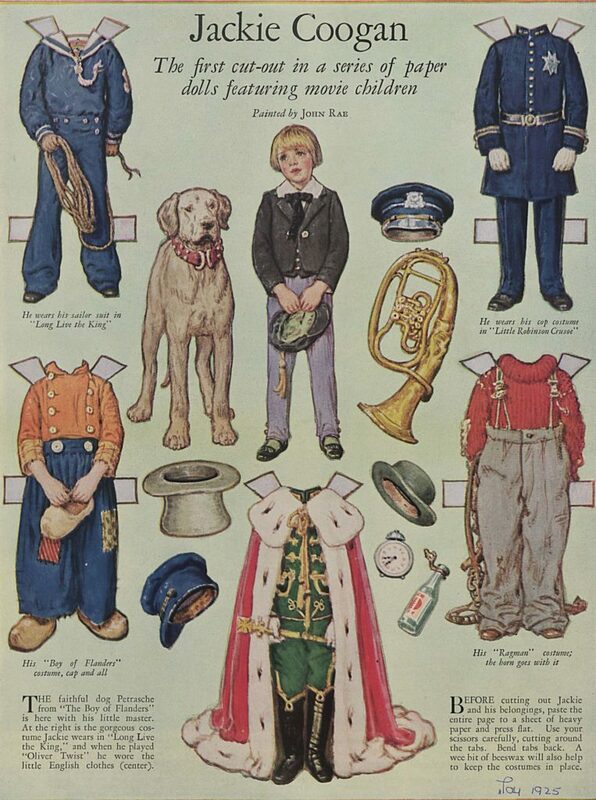 A 1925 issue of Woman’s Home Companion featured a Coogan doll with costumes from Oliver Twist, A Boy of Flanders, Little Robinson Crusoe, and The Rag Man— all movies where he starred as boys in straitened circumstances. His role in Long Live the King was a slight departure in that he was a runaway prince who was later captured by revolutionaries. Jackie Coogan and costumes. Col. 121, Waldron Collection, Winterthur Library. Coogan reached multimillionaire status by age 21, but soon discovered that his earnings had been spent by his mother and stepfather, and he could only recoup a small percentage of his millions through legal means. His experience served not only as a warning for other young actors, but also led to the passing of the 1939 California Child Actor’s Bill, commonly known as the Coogan Act, which protects their earnings and regulates schooling and work hours. Coogan survived his family’s betrayal, continued to work in film and radio, and later turned to television work, most famously playing Uncle Fester in the 1964–66 sitcom The Addams Family. 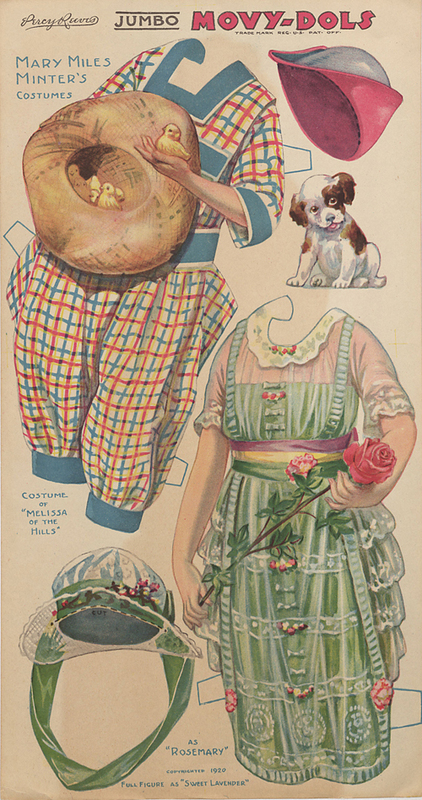 Magazines had been offering paper dolls even earlier than 1925. The film fan magazine Photoplay featured illustrator Percy Reeves’s likenesses of actresses Lila Lee and Mary Miles Minter in a 1920 Movy-Dolls series. 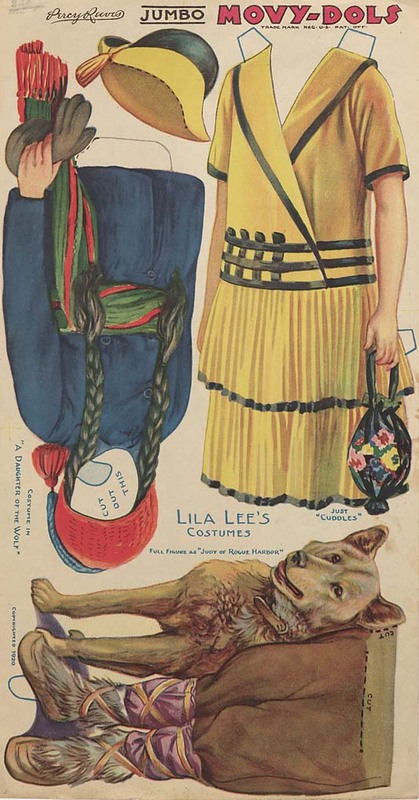 Lila “Cuddles” Lee (1910–1973) graduated to a Hollywood contract in 1918 after performing in kiddie review shows and appeared in movies alongside matinee idols Gloria Swanson and Rudolph Valentino. Reeves depicted her in her rugged costume in the 1919 film Daughter of the Wolf, a love story set in the dangerous fur-trading world of northwestern United States. The caption “Full Figure of Judy of Rogue’s Harbor,” possibly corresponding with the yellow dress and cloche hat on the same page, is misleading since another actress, Mary Miles Minter, and not Lee, played Judy in the 1920 movie. Lee was in high demand throughout the decade and though she made the transition to talkies, roles became more infrequent by the mid-1930s. She acted in a few plays and soap operas in later decades, but a string of divorces and struggles with alcoholism took their toll. Mary Miles Minter (1902–1984) followed an early career trajectory similar to Lila Lee’s but hers ended in a more dramatic fashion. With her blonde curls and demure looks, she frequently competed with Mary Pickford for many sweetheart roles. In the 1917 Melissa of the Hills, Minter played a poor young woman supporting her father Jethro during many family feuds with money-making schemes. She later fell in love with a lawyer after Jethro’s tragic death. Minter again played the title character, a housekeeper’s daughter who falls for a drunk’s affianced friend, in the 1920 movie Sweet Lavender. Despite acting in more than 50 silent movies, Minter’s career ended rather abruptly after the 1922 murder of her frequent director William Desmond Taylor. Scandal erupted when her romantic feelings for him and rumors of a possible affair with the much-older Taylor went public, casting a shadow on her reputation and influencing her decision to quit the business the following year. Taylor’s murder remains unsolved. While these paper dolls are not symbolic of the glamorous and idyllic lives of their subjects, they do play an important role of their own. With several of these movies – Coogan’s Little Robinson Crusoe and Minter’s Melissa of the Hills and Sweet Lavender—now considered lost, these surviving dolls and costumes help to preserve a bit of film history. This entry was posted in Ephemera, Library, Uncategorized and tagged coogan act, hollywood, paper dolls, silent movies, Winterthur Library, Winterthur Museum Garden & Library. Bookmark the permalink.